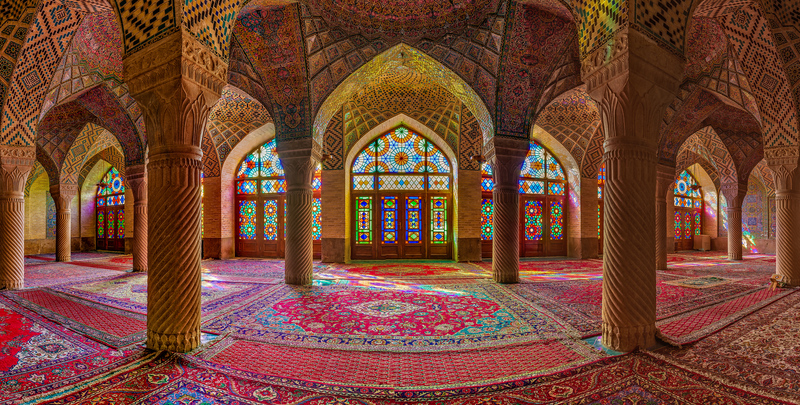 It was a photo of the Nasirul Mulk Mosque, also known as the pink mosque in Shiraz that drew my attention to the Mosques of Iran in the first place. For some reason I always thought Mosques were dark places, shrouded in mystery and strictly off-limits to non muslims. This couldn’t have been so far from the truth. 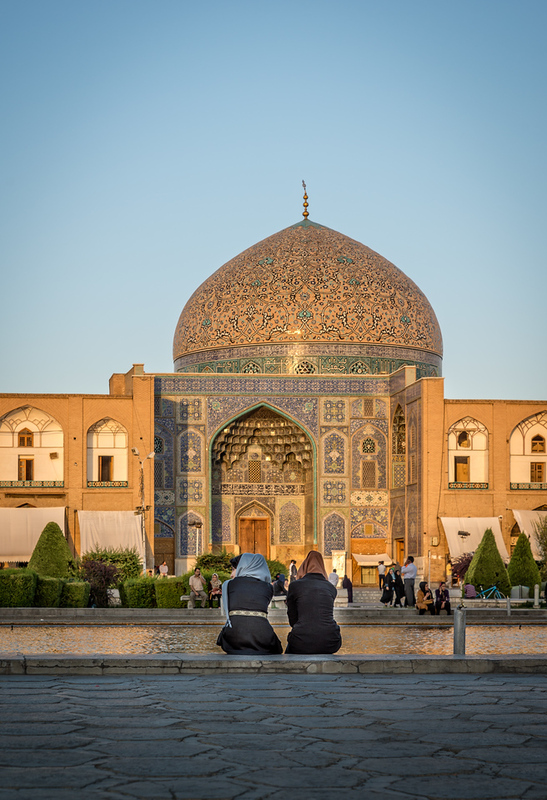 I came to Iran with a goal in mind to understand a little more about its history and Islam, as it was a religion and culture I was very unfamiliar with. Although I spoke about it to people there and learnt more about it, I still ended up with more questions than answers in the end. In fact, on a few occasions, what some people said about Islam would seem to be contradicted by something else further into the conversation. Like most religions though, any holy texts are open to interpretation and subject to ambiguity. One thing that I was amazed with the mosques of Iran was the integration of artwork into the architecture. Every tile on the walls, arches and domes were incredibly detailed, as though they were a collective art exhibition. 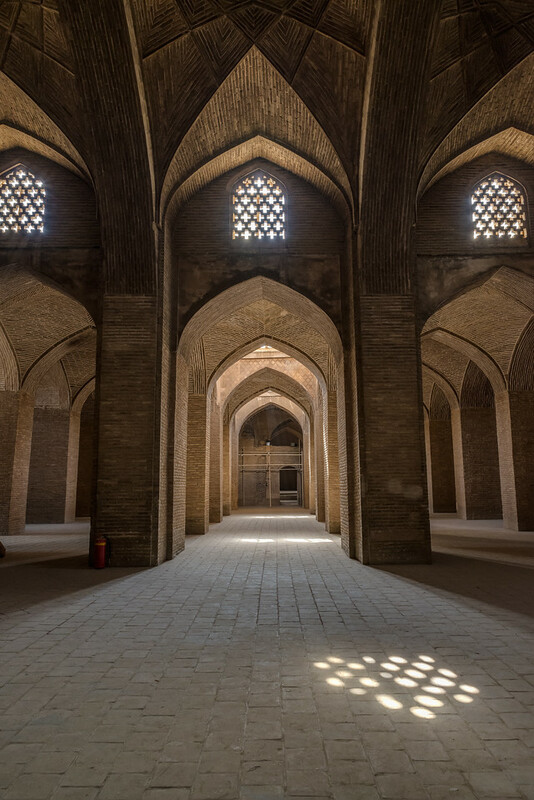 The Persians are masters of building vast spaces, incorporating impeccable geometry, having every detail carefully thought out and built with a sense of purpose in mind. Anybody is allowed access into the mosques outside of prayer time and it’s easy to become lost in the detail and discovery in every corridor and chamber. 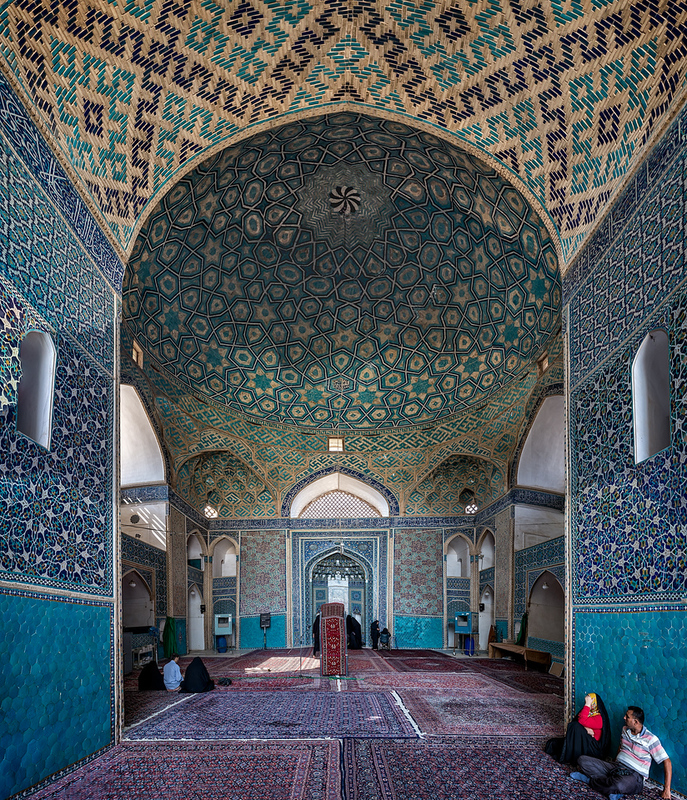 Known for the its blue mosaic tiles, the Imam mosque was built in the 17th Century and is now a UNESCO World Heritage listed site. It is considered a masterpiece of architecture, with its complex maze of rooms and acoustically designed in a way that allowed the Imam to be clearly heard without having to strain his voice. The blue mosaic tiles appear both on the inside and out and have the primary use of reflecting the daytime heat off the building. It was also able to be seen from miles away by travellers along the silk road. 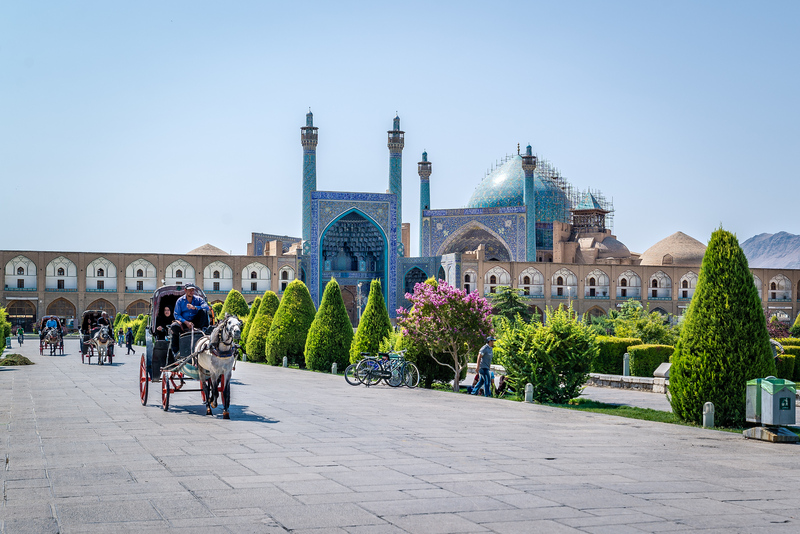 At the Naghsh-i Jahan Square looking at the exterior to the Imam Mosque. Notice how the mosque beyond the entrance is not in alignment with the square, as it is in alignment with Mecca. As a result, the entrance and the portal to the dome are in perfect view for everybody to enjoy. Looking at the entrance and minarets. The size and design were meant to represent a gateway into the spiritual world. 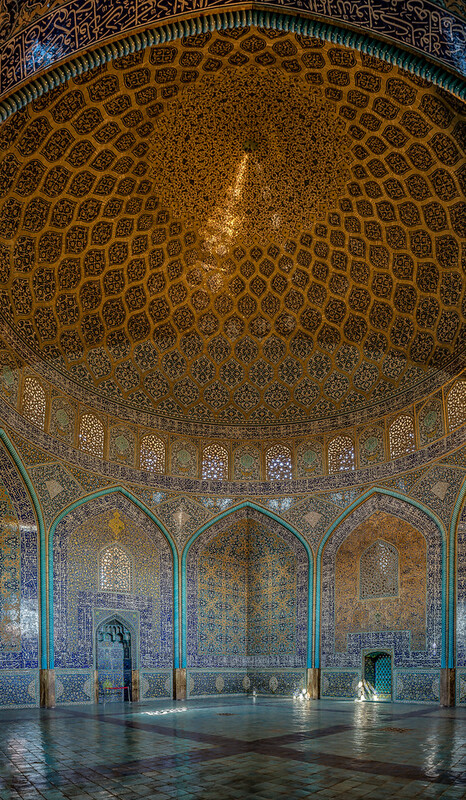 A panorama shot of one of the prayer rooms. Under the main dome. You could stand and speak into one corner of the room and the sound will be transported along the wall to the other side of the room. 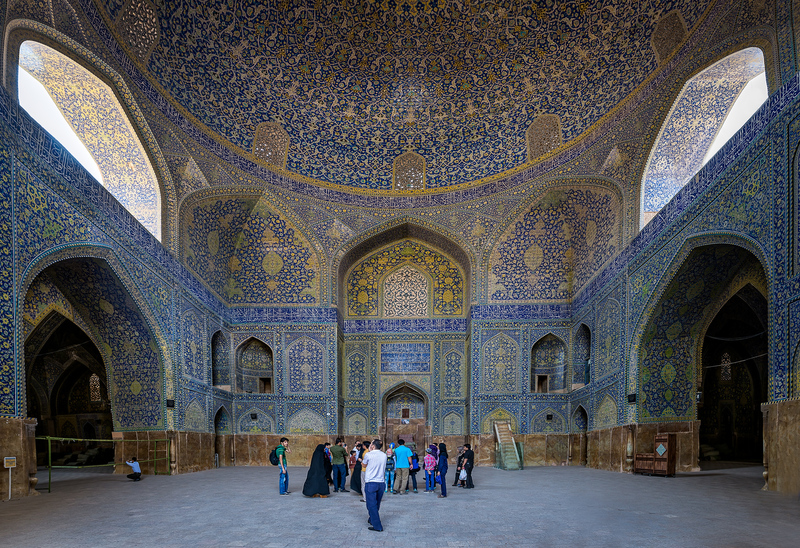 The Sheikh Lotfollah Mosque was the first of the structures to be built on Naghsh-i Jahan Square by Shah Abbas I. It was to be his own mosque for private use, hence the smaller size and the absence of minarets. 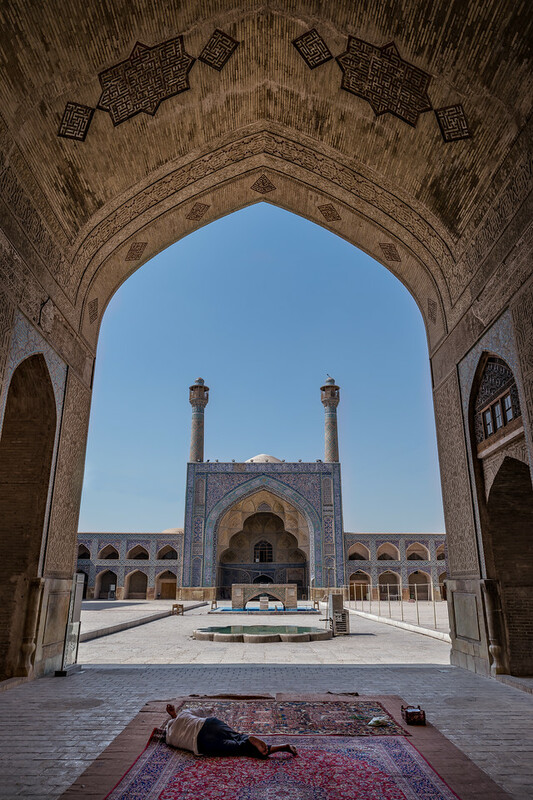 As he wanted his harem to be shielded from public contact at all times, he had the architects build a tunnel from the palace on the opposite end of the courtyard to the mosque. For hundreds of years it was closed to the public but now, its doors are open to the public to view the exquisite tile work and architecture. Golden coloured patterns on the dome become smaller as they reach the centre. There are no courtyards or network of corridors or rooms; only the one prayer room with a myriad of artistic works that have inspired the patterns for many carpet designs that are made from neighbouring stores within the square and bazaar. 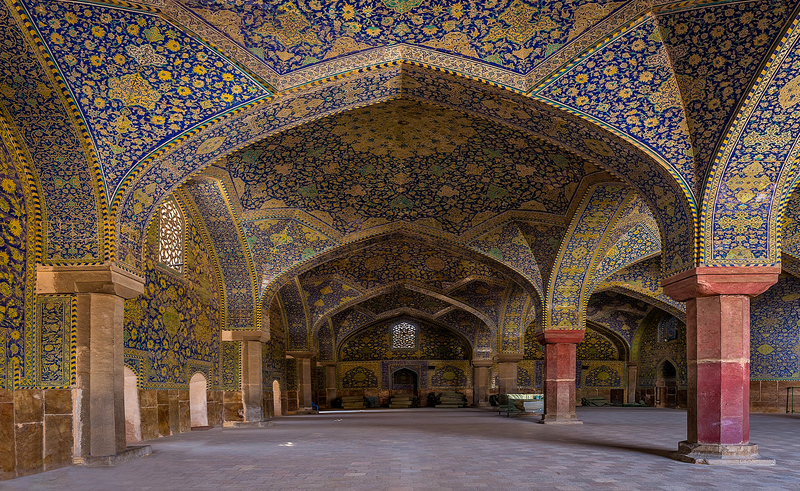 The Jameh Mosque is one of the oldest mosques in Iran. Built in 771, it has gone through various stages of reconstruction by various rulers throughout history up until the 20th century. It is located north of Imam square, but a series of undercover roads from the Grand Bazaar snakes its way from the square all the way to the mosque. Of all of the mosques, it was the least busiest when I visited, and seemed to be undergoing extensive restoration work. 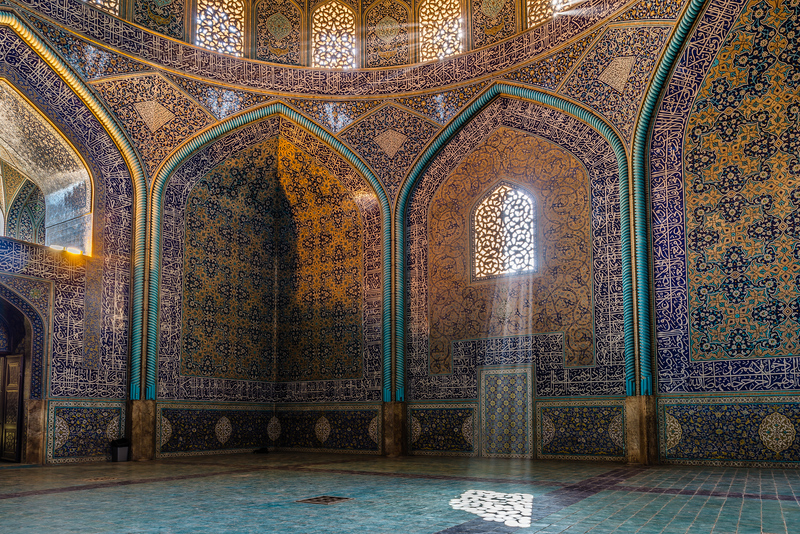 The architecture varies from room to room and is considered a condensed history lesson of Persian architecture. 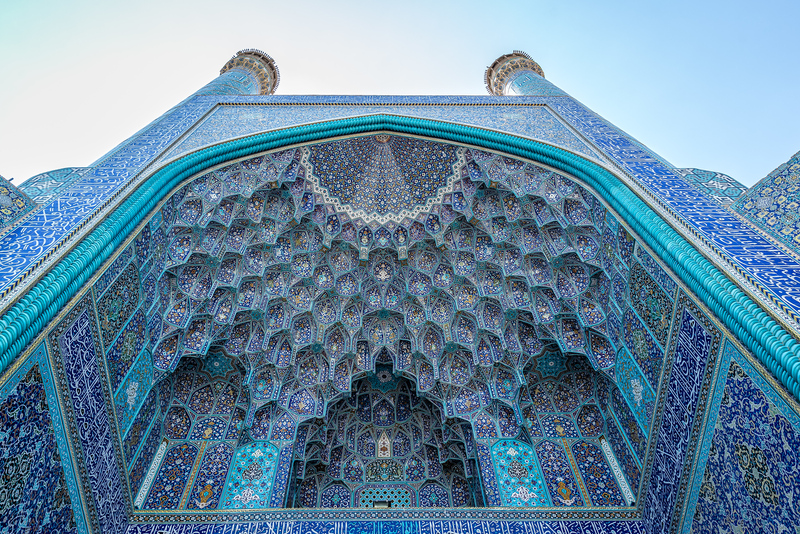 The Jameh mosque is known for having the tallest minarets in Iran as well as it’s eyecatching blue tilework from the top to bottom. 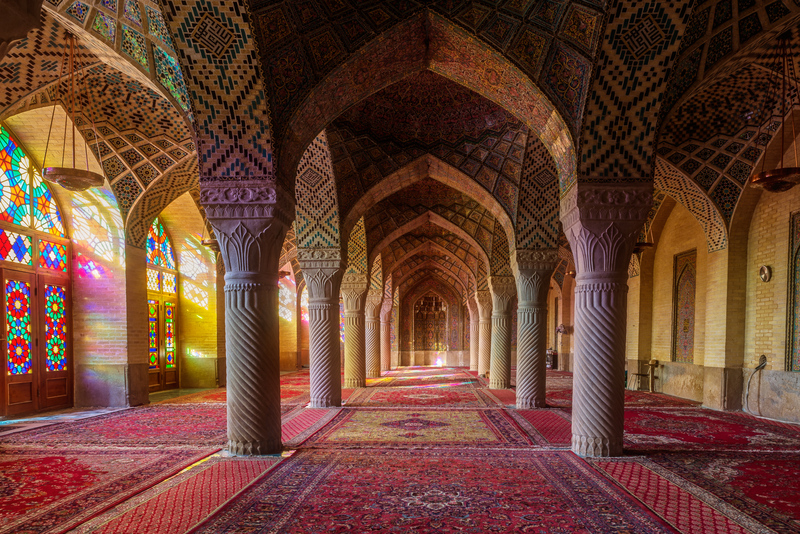 It’s now no secret that the image of this mosque captured my interest in Iran. I spent the most amount of time in the mosque on two separate visits just to capture the light at the right time of the morning as it rose over the eastern wing of the mosque and the rays hit changed to a shade of pink as it filled the room. The best time of the year to visit is in winter when the colour from the sun’s rays will reach the far end of the room. Despite its beauty, there were rarely any people inside. 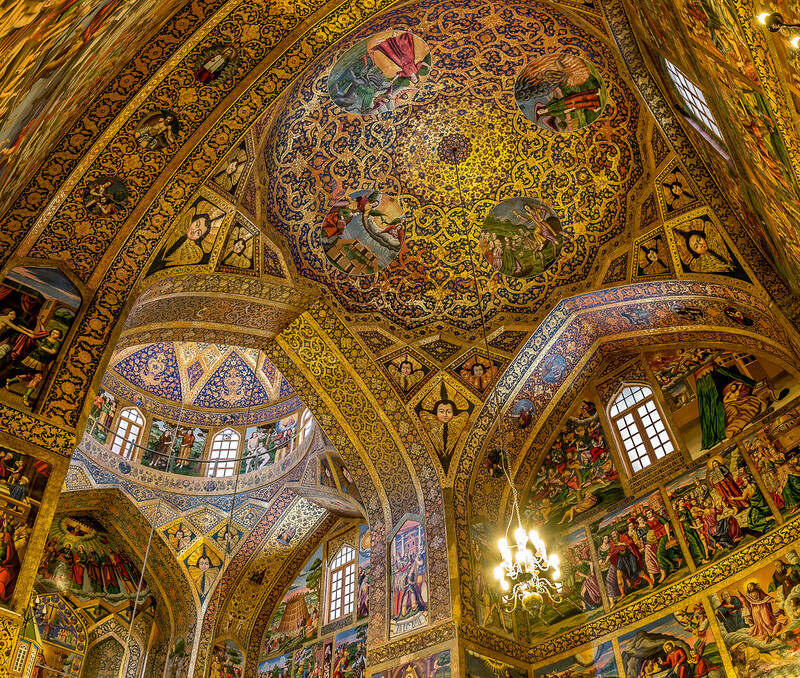 Despite it not being a mosque, I wanted to include the Vank Cathedral in Isfahan. Located in the Armenian Quarter in Isfahan, it was built by the Armenian christian community after the Shah gave them a place to resettle after persecution by the Ottomans. In return they assisted the shah, using their knowledge and networks in developing Isfahan as a major trading route along the silk road. Inside, artworks depicting biblical stories as well as Armenian martyrs. 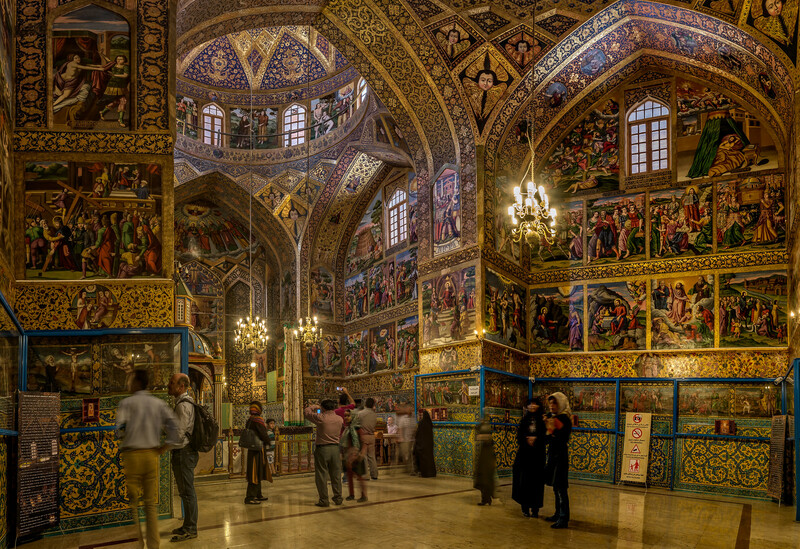 Neck pain inducing is one way of describing the interior of the Vank Cathedral. If you love any of the photos from this post, you can purchase a print from my site here. It’ll help keep me on the road just that little bit longer and to continue bringing you stories like this. TheMarket Guide for Young Writers, Ghosts. Victorian girls, maybe ones with tough names. Easter bunnies that are homicidalBunniculaCandy. White girls. More white girls. Hip hop? White girls? Bars? Wars? One word: Run. Run with everything you got, dear reader. Thank you, I think I know what to do.